During Arena time, students are pulled out in small groups to meet with subject-specific content specialists for mini-lessons or interventions. The content specialists work with generalist teachers during weekly meetings to review student progress and facilitation plans (student learning plans). Real-time data is analyzed and applied to identify small targeted groups of students with similar needs (e.g. additional writing support, acceleration opportunities, short science lessons, and other content specific supports). If students in the same Arena have a similar need, specialists “push in” to create a small group within the classroom. If there are students across different Arenas with a similar need, specialists pull those students out to create a small group in a different room. During the Arena block, students are able to work on specific subjects they are passionate about and get additional time to dive deeper into that content area with support of an expert teacher. 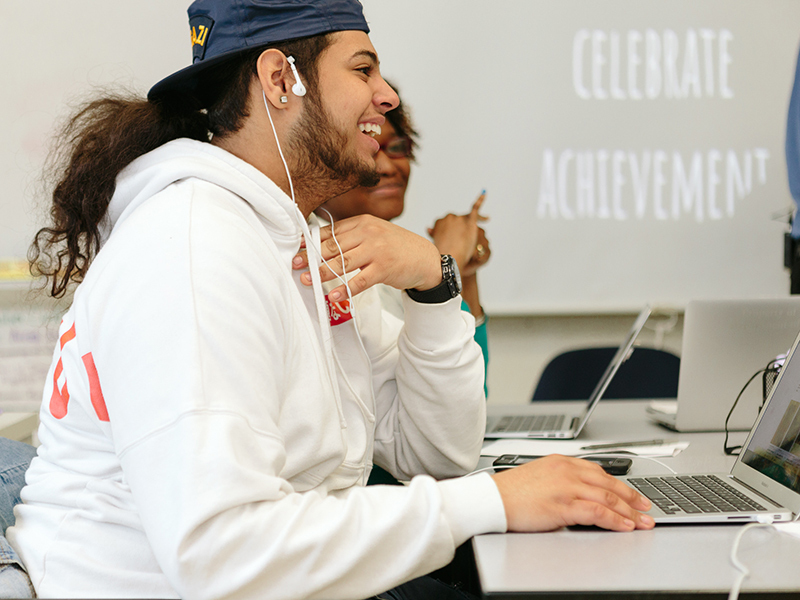 This additional small group and one-on-one time also ensures more focused support which can act as an accelerant, helping students gain more credits and become college ready within the two to three year window required for most Bronx Arena students. Selects courses of interest for primary and secondary credits. Works at his or her own pace through coursework to earn each credit. Receives individual and small group support as needed to progress through coursework. Content specialists “push into” classes for individual student support or to instruct small groups of students with similar needs. Content specialists pull out students with similar needs across different Arenas to create small groups in a different classroom. Helps teachers and students keep track of learning sequences of each student through facilitation plans. Helps teachers and students monitor progress by viewing data on the tracker, identifying which students need support and when they need it.